TORRANCE, Calif. (May 26, 2009) – June brings with it warmer, longer days and more time spent working outside and enjoying the great outdoors. While the summer sun may make you feel carefree, it is as important as ever to be careful, particularly when operating equipment. June is the National Safety Council’s National Safety Month, and Kubota Tractor Corporation wants to take this time to remind all equipment users – and especially utility vehicle drivers and riders – to always make time for safety. · Always read the owner’s manual carefully before using a utility vehicle. · Heed all warning labels posted on the utility vehicle; all warnings and instructions included within the owner’s manual; and/or safe operating manuals or videos. · Utility vehicles are for off-road use and should not be operated on highways, streets or other paved roads. · Seatbelt use is imperative when driving and riding in a utility vehicle. · Drive at safe speeds and stay alert to the changing terrain. 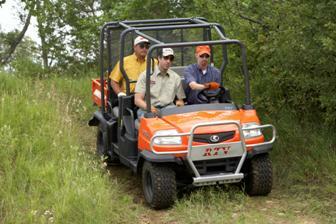 · Utility vehicles, depending upon the model, are designed to carry a specific number of riders other than the driver. Be certain to allow only the recommended number of riders to match the seatbelts in place for the specific utility vehicle. · Utility vehicles are not toys and not for kids. Owners need to take extreme care to keep their families safe and allow only those who meet the manufacturer’s guidelines for operation and who understand the safe operating instructions to drive the vehicle. · Follow all directions included in the owner’s manual regarding any riding gear, clothing or helmet recommendations, dependent upon utility vehicle model and manufacturer. · Inspect all tires, wheels and attachments to make sure they are in good working condition. When it comes to tractor safety, Kubota strongly recommends customers be sure that older tractors and equipment have a seatbelt and Rollover Protection Structure (ROPS) to provide a protective zone around the operator – greatly reducing the chances of serious injury in the case of a rollover accident. Kubota has provided a ROPS as standard equipment since 1985. Owners of early Kubota tractor models can visit www.kubota.com to utilize a ROPS and seatbelt installation function that will allow them to submit their tractor’s model and serial number to obtain retrofit pricing for eligible models from their local Kubota dealer. To date, Kubota dealers throughout the country have installed more than 11,000 ROPS retrofits. According to the NSC, if all tractors were equipped with a ROPS and a seatbelt, about 350 lives could potentially be saved each year. Kubota supports safety education for its customers and their families by sponsoring the Progressive Agriculture Safety Day™ educational program, part of an effort designed to make safety education and training available for children year-round. Now in its 15th year, the program will conduct more than 350 Safety Day events in 2009 across the United States and Canada. In 2008, the programs reached more than 84,000 children and adults in rural communities, and to date has touched the lives of more than 740,000 participants. Additional information about Kubota’s support of the Progressive Agriculture Safety Day education program and safety information including Kubota’s “Ten Commandments of Tractor Safety,” a tractor safety coloring book, and informational safety video “It’s a Family Affair” can be found at the Kubota Web site, www.kubota.com. (888) 4-KUBOTA [(888) 458-2682], Ext. 900, or visit www.kubota.com.